Maple Apple Upside Down Skillet Cake is quite possibly the best cake I’ve ever made. Bold words, I know, but I mean them. I held off on boarding my Crazy Fall Train as long as I possibly could because I *KNOW* there are people out there (like my husband) who just can’t HANDLE the fact that the leaves are going to turn colours and fall to the ground and the air is going to become crisp, cold, and lovely. All my resolve crumbled in nanoseconds when I walked into my favourite farm stand and saw the first Jersey Mac new crop apples. Gorgeous, crisp, tart, new FALL apples. I gave up, because I am what I am, bought a tote bag of apples and went home to contemplate the glory of the upcoming autumn. The first thing I did was work on this cake that’s been baking away at the back of my mind just waiting for the fresh apple crop. Maple Apple Upside Down Skillet Cake combines my two favourite Western New York seasons of fall and spring -or, as I refer to them- apple and maple seasons. Maple Apple Upside Down Skillet Cake is everything wonderful about Western New York in one lush cake. It’s tender, rich, indulgent-tasting, and absolutely covered in apples that bake to being meltingly soft in a pure, dark maple syrup caramel sauce. Oh… and hey… it just happens to be egg and dairy free, making it *gasp* vegan. Don’t look at me like that. This cake rocks the Casbah, baby. My husband was absolutely shocked when I told him it was a vegan cake. Big words for a grand cake, folks. If you don’t take my word on anything else this year, take it on Maple Apple Upside Down Skillet Cake. Let’s start at the top. I used Dark Grade B Maple Syrup in Maple Apple Upside Down Skillet Cake because (as I’ve said here, here, and here) it just plain packs more maple punch. If you don’t live in maple country, I’m happy to let you know that you can purchase it online. If you can’t /won’t order it, you can substitute real amber maple syrup, but it won’t have those deep caramel notes that Grade B maple syrup has. I’m relatively sure you probably already know this, but I’m going to say it anyway to head this question off at the pass. It’s a no on subbing pancake syrup for the dark maple syrup. Just don’t do it. Not even ‘maple flavoured pancake syrup’. This is a job for the real deal. There is a whole world of apple varieties out there from which you can choose. I used a combination of two super fresh apples: Jersey Macs and Ginger Golds. 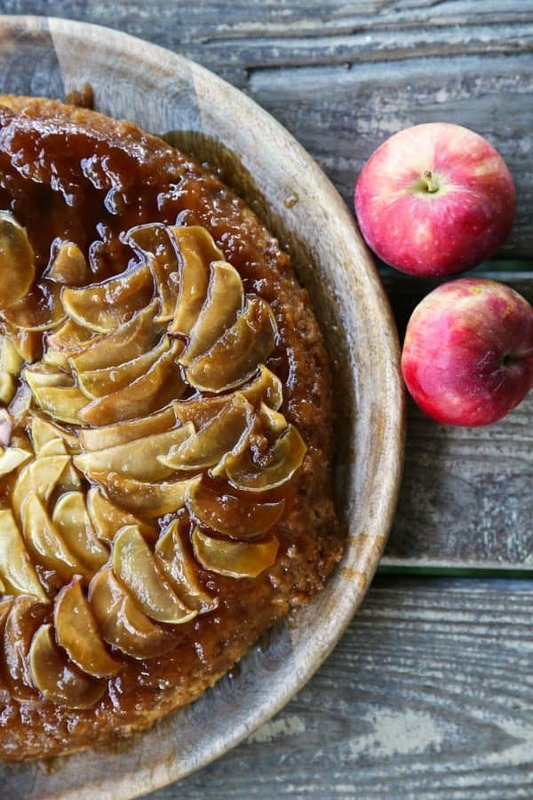 Try to pick a tart, firm apple that won’t brown so quickly when cut and is known to be a good baking apple. Some other nice choices are Empires, Honey Crisps, Idareds, Romes, Jonamacs, and Paula Reds, just to name a few. Truth: I like pretty things, so I took my time and arranged the apple slices in concentric circles. Do you need to sweat this? Nope. As long as you cut them all roughly the same size and thickness (please shoot for 1/8-inch thick), you can toss them all in the pan on top of the maple syrup and not worry about the pattern. Trust me. You’re going to want to use an oven-safe 11 3/4-inch or 12-inch skillet. Ideally, you’ll be using a cast-iron skillet because it’s so darned good at conducting and retaining heat evenly. If you don’t have a skillet that large, I’d advise halving the recipe and putting it in an 8-inch cake pan, adjusting the baking time accordingly. Begin testing for doneness around 23 minutes if you downsize the recipe. If you want to use my absolute favourite skillet for the job (the one pictured in this post), it’s available for ordering here. If you’re worried that your skillet or pan is undersized, please place your pan on top of a rimmed cookie sheet to catch any spill-over. My 11 3/4-inch skillet was The. Perfect. Size for the job. Sucanat. It’s short for Sucre de canne naturel. Yep. I know, it sounds like a high-falutin’ French ingredient unless you grew up in a household with hippie parents (ahem) and/or you’re into health food. Don’t let the health food associations fool you, though, it’s ridiculously delicious with front notes of caramel and molasses. Once you’ve tried it, you’ll try to find ways to slide it into food as often as you can. It makes sugar seem insipid. That being said, if you can’t find it/won’t order it, you can sub in an equal volume of granulated sugar. Unsweetened almond milk. Just do it. Just about every mid-sized grocery store in America carries this now. If you can’t find it, and have no objection, you’re welcome to sub in whole dairy milk or another unsweetened, non-dairy milk. And finally, but certainly not least, extra virgin coconut oil. This stuff is basically my be-all-and-end-all. Oh sure, I cook with it almost as often as butter, pop my popcorn in it exclusively, and use it in place of butter for holiday/special occasion treats for my non-dairy friends, but PEOPLE, it’s like the bass-o-matic of fats. I also use it for an all-natural make-up remover, moisturizer, and other crunchy beauty treatments (see above hippie parent reference.) Again, most moderately stocked grocery stores will carry extra virgin coconut oil (solid up to 76°F, then magically liquid), but you can (as I do) order it from Amazon.com, as well. Heck, folks, I have it auto-shipped monthly. That’s how much I love it. And mes amies, if you can’t/won’t order coconut oil, you can sub in butter, but I prefer this made with the coconut oil. Maple Apple Upside Down Skillet Cake is tender, rich, and covered in apples that bake to meltingly soft in a pure, dark maple syrup caramel sauce. Preheat oven to 350°F. Generously grease the inside of a 11 3/4-inch or 12-inch cast-iron skillet with extra virgin coconut oil. Pour the maple syrup into the bottom of the pan. 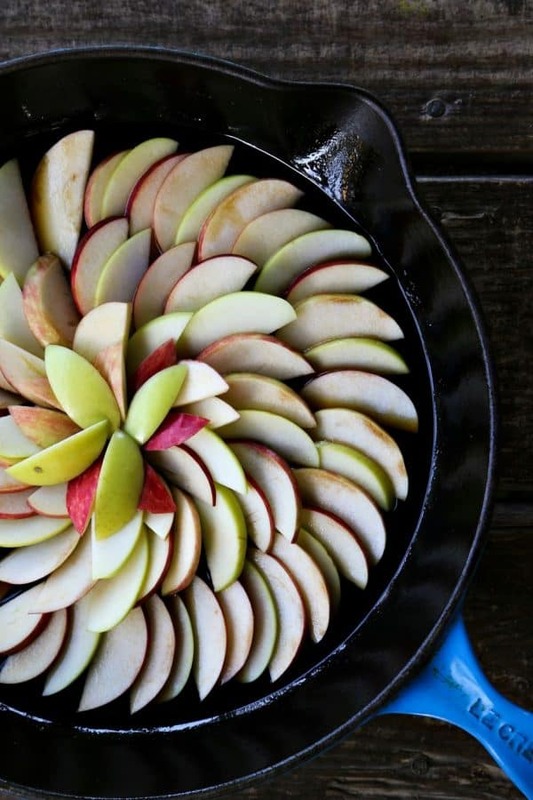 Arrange the apple slices in concentric circles on the bottom of the pan. In a mixing bowl, whisk together the flour, sucanat or sugar, baking powder, and kosher salt until even. In a separate bowl, whisk together the almond milk, coconut oil, and vanilla extract. Pour into the flour mixture and use a silicone spatula or wooden spoon to stir the two mixtures together until no dry pockets remain. Scoop in dollops over the apples and gently spread toward the edges to level. Bake for 35 to 38 minutes, or until the top has browned a bit and a toothpick inserted in the center comes out clean. Let the cake cool for 10 minutes on the stovetop. To transfer to a plate or cake stand, run a thin knife or spatula around the inside of the pan. Invert a plate or cake stand that is larger than the circumference of the pan over it. Carefully hold the plate to the pan as you invert the whole shebang. The cake should come out of the pan easily, but if it needs a little encouragement, smack the back of the pan firmly with your hand a couple of times. Carefully remove the pan. The maple syrup will run down the sides of the pan onto the platter. Serve warm, room temperature, or cool. Leftovers can be stored tightly wrapped at room temperature for up to 5 days. mmmm that caramely top looks so delicious!! Definitely can’t go wrong with a good apple cake! Absolutely stunning, I can’t decide if it’s prettier cooked or uncooked! I adore maple, so this is a must try, thanks! Can I sub in a stick of butter for the coconut oil? 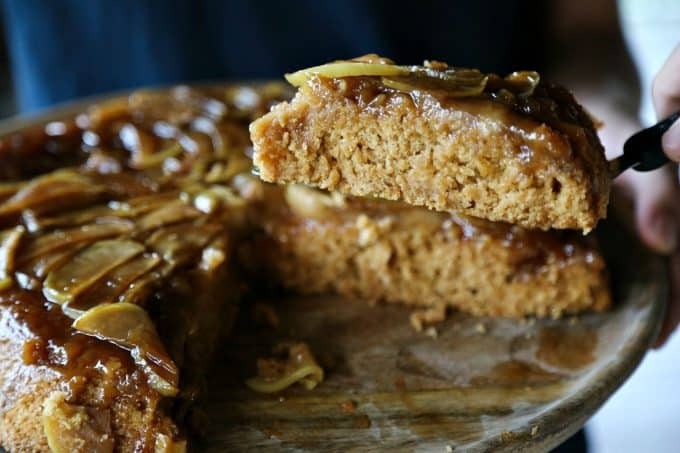 I love coconut oil, but have some beautiful Ginger Golds and want this cake preferably tonight and I do not have enough coconut oil. Everything else I have. Sub in a half a stick (1/4 cup) for the coconut oil. 😀 You can absolutely do that! I prefer the finished product made with coconut oil, but this is good, too! I’ve finally gotten my hands on some grade B! And my cripps pink will have to do. Now, I’m reading the recipe says a full half of a cup of coconut oil, right? Also, if I run out and sub real butter, it’d only by 1/4 cup of butter? Because that’s a hefty liquid difference and I trust you. Just wanted to make sure I’m following right! The cake looks VERY tasty. But I bet you mean coconut oil not olive oil in the last part of the last note? You’re very, very correct! 😀 Thanks, Alice! Can I tell you a secret? I’m ready for fall. Not winter, not the brutal cold or snow. Just… fall. Point being, I love this cake ’cause it’s gearing me up for the season to come. And, of course, because it looks absolutely delicious! Perfect for a leisurely brunch with friends or an end to a meal, served with a big pot of tea. Oh this looks like the best cake ever. My mouth is watering… And you know, even Aldi carries Coconut Oil now. I love everything about this cake! I need this ASAP!!! This was delicious! It definitely had a molasses flavor with the succanat and I thought I would be able to share with coworkers, but my family devoured it. There are only three of us. We ate the whole thing…. I hear ya. We kind of did another one in in one night here. It’s a little on the dangerous side! so easy and very yummy – your cake satisfied an urgent sweet craving we had after supper tonight:-) made 1/2 recipe in smaller stainless skillet and it worked out great. since it was an “emergency,” had to use regular sugar, soy milk, and a mix of coconut oil + Earth Balance – still turned out to be an exceptionally moist cake with a lovely gooey topping. who knew maple syrup could be so therapeutic? thank you – this recipe is a keeper! This looks so good! But i can’t figure out what I did wrong. Mine did not fully cook in the middle, even after 45+ minutes. And, though I tried to seal the edges, that maple syrup made a burnt mess of my oven. The only sub I did was whole milk for the almond. I hate to have wasted all of the ingredients. My baking powder is good, I double checked all the amounts, and yes I measured the flour right lol. Any ideas? I’m determined to try it again! Because the flavors are fantastic. Funny enough… I put an oven thermometer in the (brand new) oven in several spots and it registered 350 everywhere. Baked in the big 12″ cast iron skillet. The middle third of the diameter is what was gooey. I have a double oven with the small upper oven and baked it in that one. Next time maybe in the bottom one! It managed to fully cook after I put it back in, albeit later in the morning. Aaaaanyway…forgive the email-worthy comments and thank you for your time! You’re one of my top three favorite food bloggers! Thank you so much, Emily! You’re so kind! I am a little lost about what happened there. I’ll have to give it some thought. In the meantime, let’s just say increase your baking time until it tests done in the center! I’d love to try making this for my husband, but he is newly diagnosed with celiac…do you know of anyone who has made this successfully with GF flour? Hi Marina- I’m thinking it’ll work pretty well. I have a sister who owns a GF bakery and have a little experience with baking GF cakes. They’re far easier than GF bread if you ask me! 😉 I think a GF all-purpose 1 for 1 blend should work well. King Arthur makes an excellent one!! Thanks! I’ve just started trying to find all the GF places to eat and shop in Phoenix. Not a huge selection so far. He is also being tested for a dairy protein allergy. So, basically I’m trying to empty out my pantry and fridge of all the poison and start on a fresh and exciting, new culinary adventure with lots of modifications along the way. Wish me luck! I have not tried Salad and Go. We used to go to Sweet Tomatoes quite often, but that was before GF days. I could’ve swore that all the restaurants we frequent had lots of great GF options, but in reality, some of them have maybe 1 option and most of them don’t have anything. GF has been such a peripheral thing for me, aware of it, not paying too much attention because it wasn’t a thing for us. We do have True Food Kitchen and Flower Child. They are amazing and delicious and a revelation as to what can be done if you are creative and adventuresome. However, our budget can’t handle more than 1x per month, if that. I’ve found a few blogs where I feel recipe modification may be a win for us (yours is one of my top 3 because you have such a great “crunchy” vibe, I feel your recipes will be simpler to modify because the foundation is good). Thank you for your kind replies! You’re very welcome! 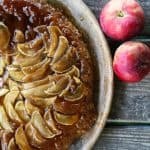 Please let me give a shout-out to my friend Mary’s blog- barefeetinthekitchen.com – every single one of Mary’s baking recipes has a gluten-free version! Her son had to eat gluten-free for many years, so she has some FANTASTIC cake recipes that are GF! !